Silver Bells | Standard Figurines | One Price Low Flat Shipping! 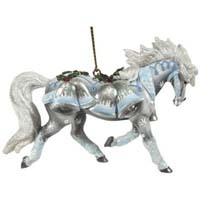 From Westland Giftware's Horse of a Different Color Holiday Collection, Silver Bells Arabian Horse Ornament. Made of hand-painted resin. Measures 2.25" tall. Packaged in decorative windowed tin case with ready to hang cord. This painted horse ornament features an Arabian adorned with white snowflakes, large silver bells and holly berries.